Cold smoke in October isn’t very common, especially on the lesser peaks in the cascade range. This year however, an unusually wet and cold storm had been moving through the mountains, and I’d been watching the snow pile up on the Hoodoo webcams for the past several days. 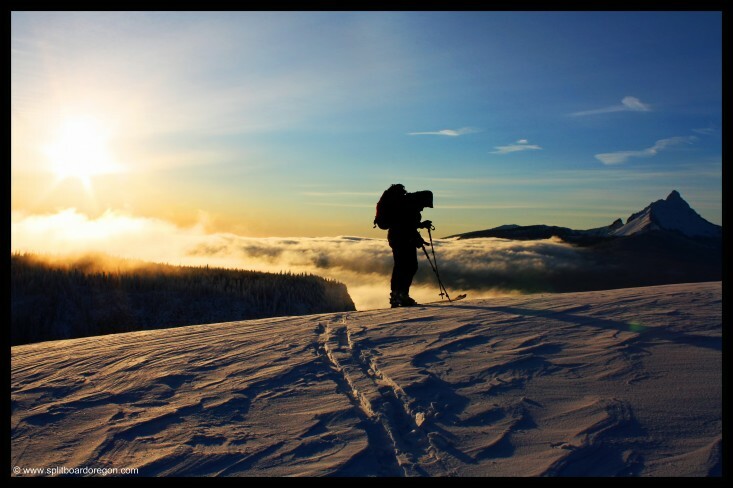 A perfect weather window looked to present itself for Wednesday morning, with sunshine and cold temps forecast, and that was all the persuading Todd and I needed to head to the hill for an early season dawn patrol. Driving up Highway 126 well before the crack of dawn, we arrived in the parking lot shortly before sunrise, and were greeted by roughly 25-30 inches of fresh snow. 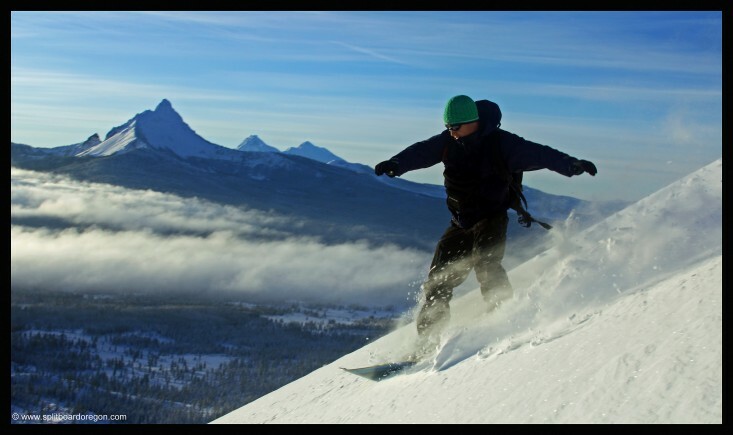 After putting on the skins and loading the packs, we started skinning and I knew it would be good when my boards hit the snow. 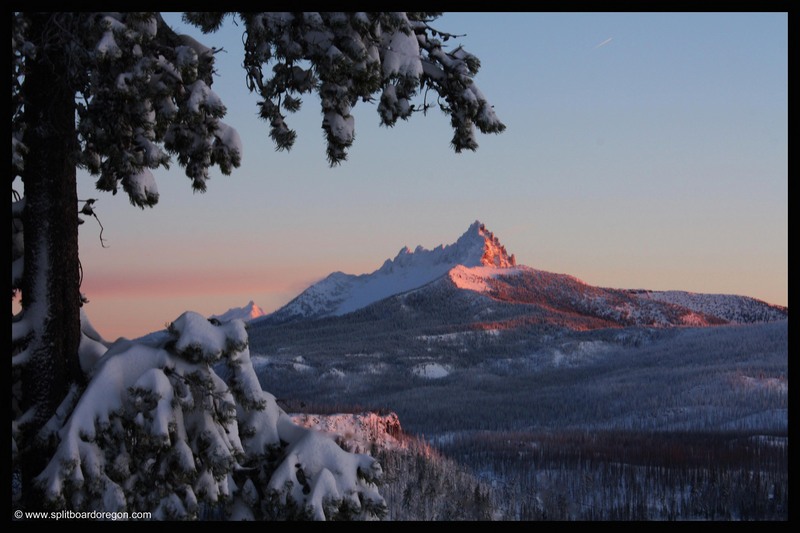 Looking back to the east, the view of the morning sunrise over Black Butte was stunning…. 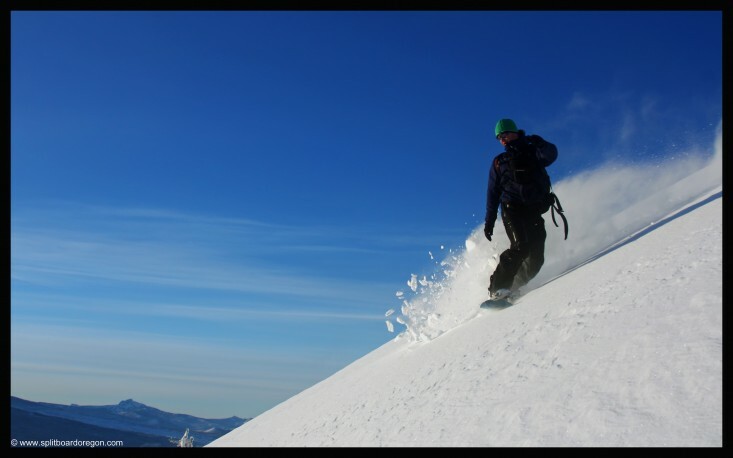 Continuing up, it felt odd to be skinning through such deep snow in October, and the lure of pristine powder turns after a long fall and summer brought us to the top in relatively short order. 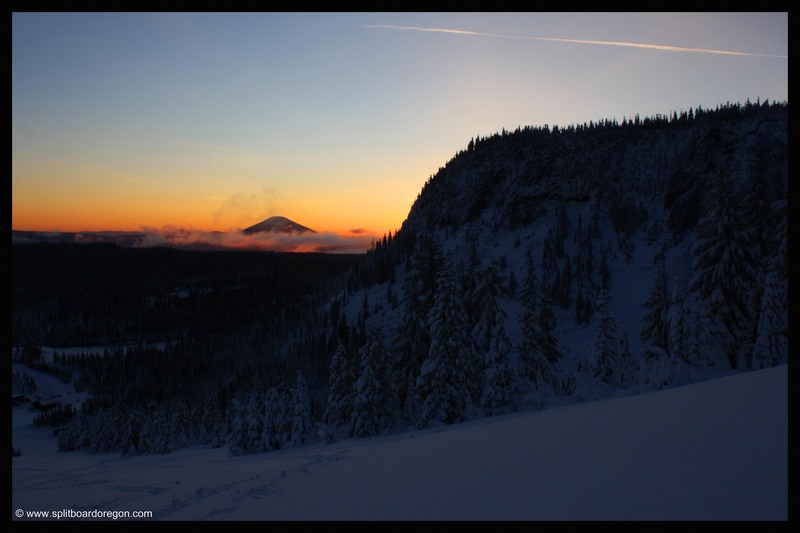 The early morning light across the highway to the north on Three Fingered Jack made for a nice photo….. The snow was deep enough that we elected to head right as we neared the summit and skin up the east face to avoid the last few hundred yards of harder skinning. As we rounded the last corner and crested the top, I took this shot of Todd with Mt. Washington in the background…. Once on top, we ripped skins quickly and strapped in. 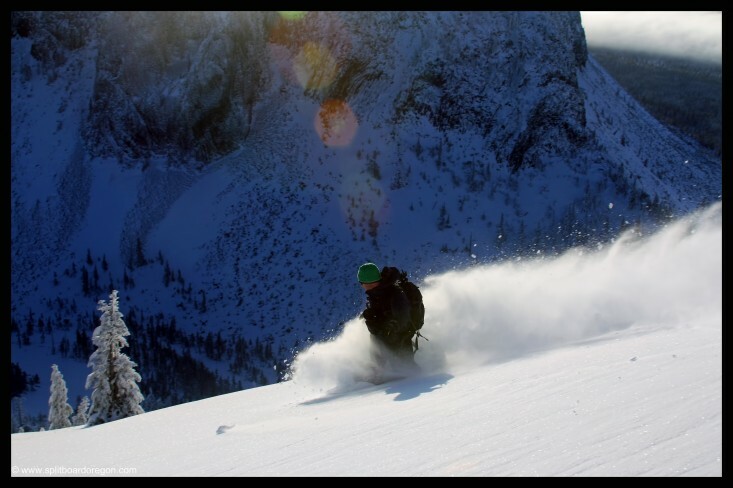 The first run down was excellent , with each turn yielding some of the lightest snow a person will ever find in the Oregon cascades, and face shots aplenty. Todd pulled his hamstring at the bottom of our first run, so I headed back up solo with my Burton Custom DIY split, and run number two was equally as good as number one. This time I dropped directly down the main bowl, and was rewarded with several more face shots. Back at the car, it was hard to leave such good conditions, and looking back on it, next time I’ll probably tell work to pound sand, but since both Todd and I had obligations back at work, we headed out. The drive home passed quickly, both of us high on early season powder turns, and we pulled into the office by 11:00 am. Overall, conditions couldn’t have been any better for late October. Unfortunately, the snow isn’t going to last, as warmer temps are forecast to return along with rain showers. It was pure bliss while it lasted though, and something I hope to repeat soon when the timing again is right!